I was planning to post this a lot sooner but I am finding it increasingly difficult to find any spare time lately, in the last blog I went through the final instalment of deleting essbase members and I thought that it would be worthwhile just finishing off with a post closely linked to the last blog but this time going through how to rename essbase members. Currently there is no way to rename essbase members without engaging in some sort of customisation in ODI, even with just essbase it is not as easy as it should be but anyway let me take you through a method to achieve this. If you didn’t read the last blog on deleting members this blog will not really make much sense because it uses the same concept and I will be reusing elements I created during the blog. 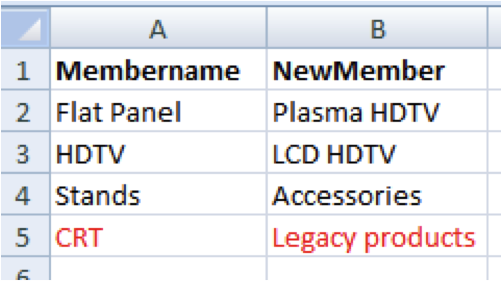 In the previous blog the source flat file only contained one column with the member to be deleted, as this solution will be renaming members it requires one column with the original member name and another column with the renamed member. The source does not have to be a flat file it could be easily an RDBMS source. In the source file there is a member that doesn’t exist in the outline so the solution should log and ignore this record. Within the designer a new Datastore was created and reversed to handle the source file. 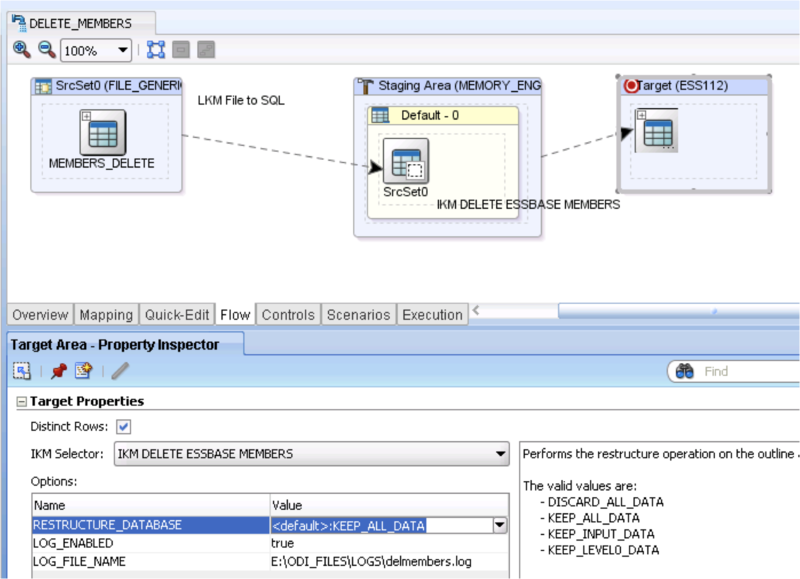 A new model was then created, this step is not essential as it is possible to modify existing essbase related models and add a new Datastore. 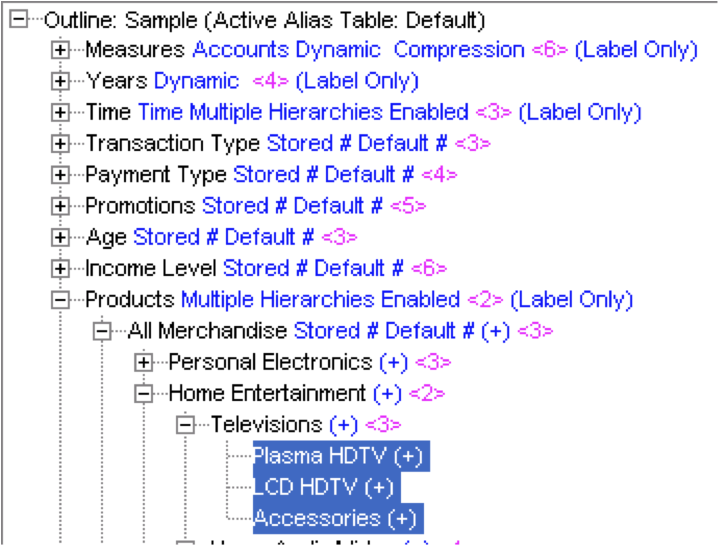 The model is associated with a Logical schema that physically points to the ASOSAMP.Sample database. A new Datastore was created. Two columns were added one to handle the current member name and the other for holding what the member will be renamed to. To save time the customized IKM that was created in the last blog could be duplicated, I am going to assume you read through the last blog but didn’t create the IKM so a new would need to be created. 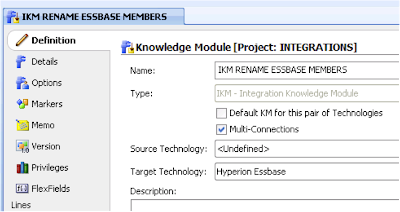 The IKM was named “IKM RENAME ESSBASE MEMBERS” with Muti-Connections enabled and Target Technology set to “Hyperion Essbase”. 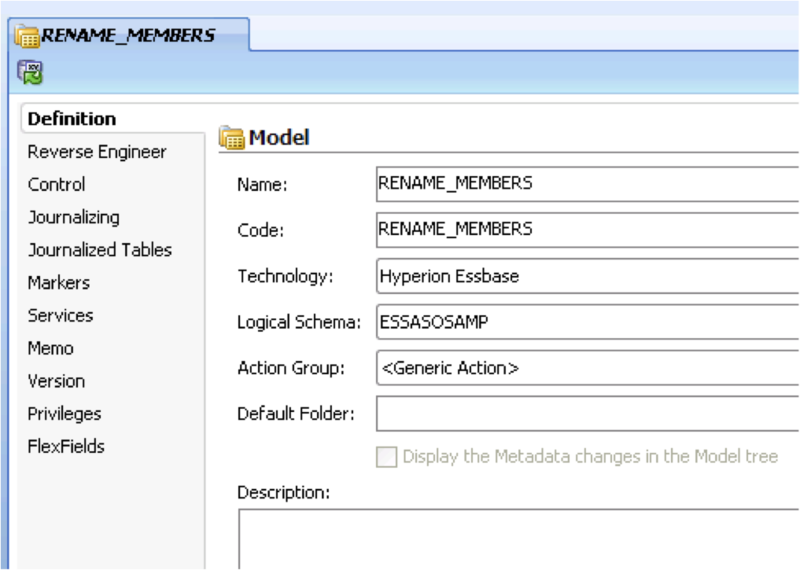 Three options were then created for the KM, the options are exactly the same as the ones used in the current “IKM SQL to Hyperion Essbase (METADATA)” and the information can be copy and pasted across. 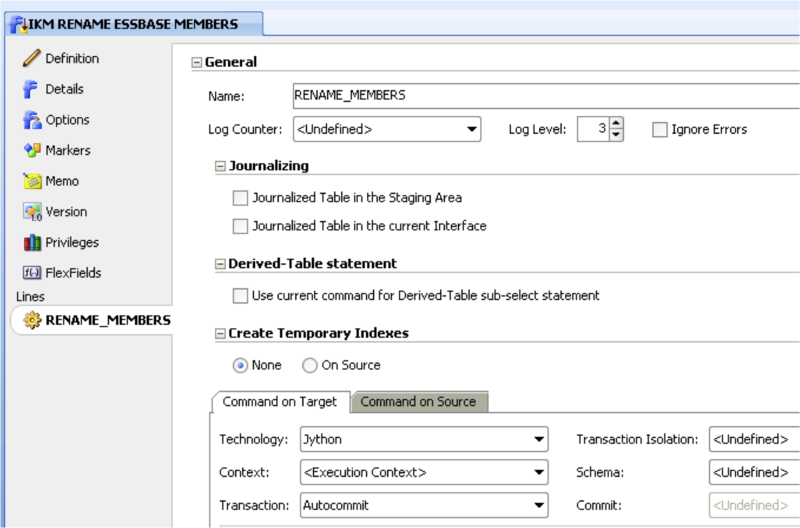 The RESTRUCTURE_DATABASE option will hold the value of how the database should be restructured once the members have been deleted. Option to set whether logging will be enabled or not. Option to hold path and filename of log. A new command “RENAME_MEMBERS” was added to the KM and technology set to Jython. The following code was then added to the command. I will briefly go over what the script does; once again it is pretty much like the delete member script. First the Java classes that are going to be used in the jython script are imported; this includes the Java class that will be called to rename the members. Next the essbase connection properties are stored; these values are retrieved from the target Datastore used in the interface using the ODI API getInfo method. 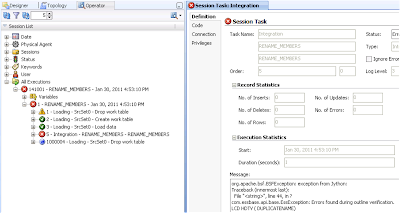 The KM options used in the interface are then retrieved using the ODI API getOption method and stored in variables. The variables are all stored in a HashMap, the HashMap is passed into the Java class. 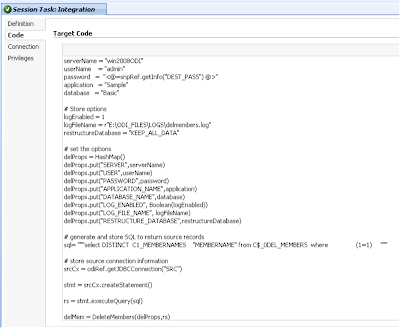 A SQL select statement is generated and stored by using a combination of ODI API methods, this code is exactly the same as used in the current essbase KMs. 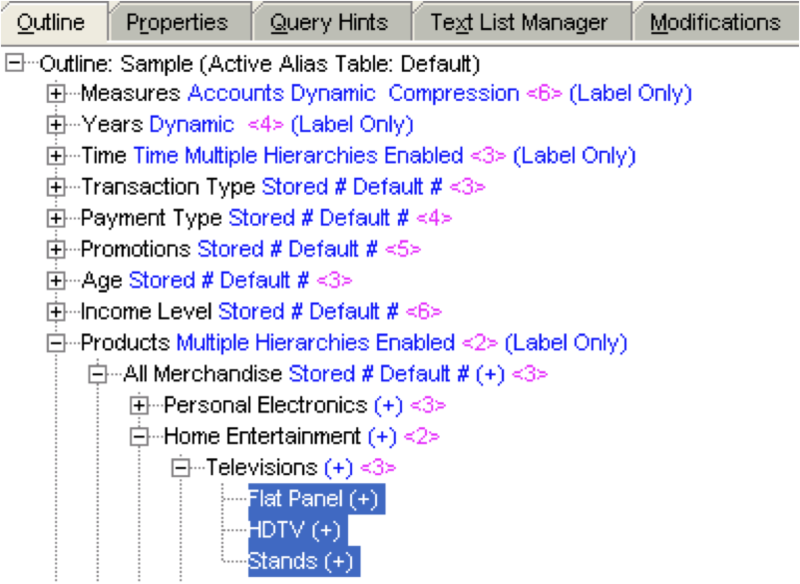 The SQL will retrieve all the records in the source/staging area. 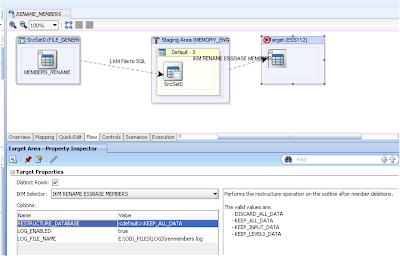 The source JDBC connection that is being used the interface is then stored. 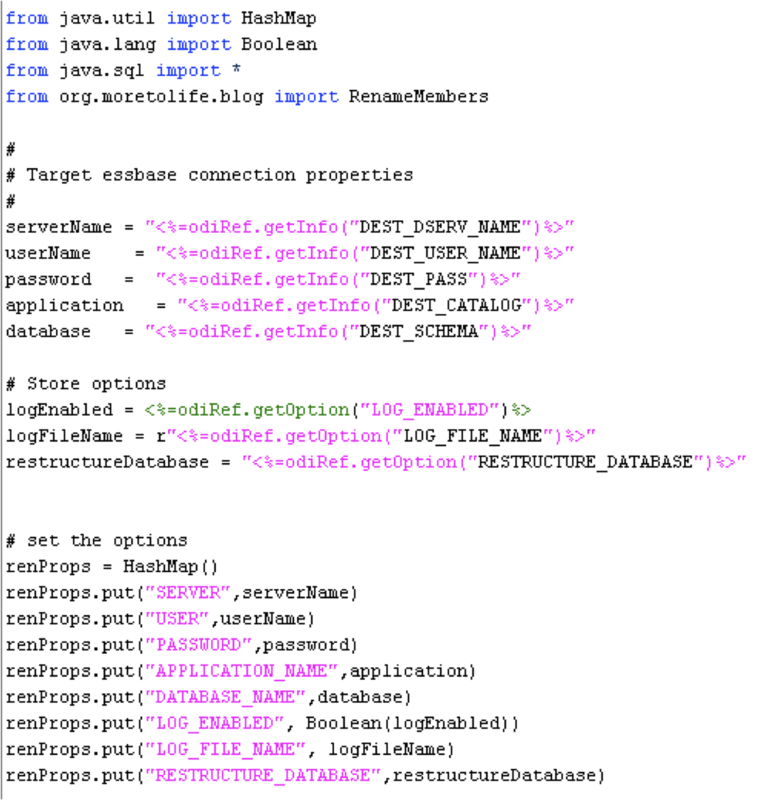 The requirement for the Java class is to extract the variables stored in the HashMap and then use this information to connect to essbase using the API, once connected open the database outline, cycle through the members held in the ResultSet and search for them in the outline, if the member is found then rename it, if the enable log option is set then log the renames and members not found. 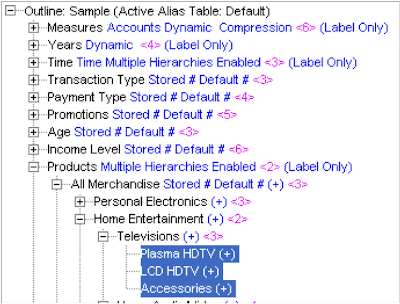 The database should then restructured depending on the value stored in the RESTRUCTURE_DATABASE option. The only real change from the delete members class is the rename(java.lang.String newMbrName) method is used. The class was compiled and a jar file created, if you are using ODI 10g then the jar file needs placing in the <odi_home>/oracledi/drivers directory, all ODI components including agents will need restarting to pick up the new file, if on 11g and using a standalone agent then place the file in <odi_home>/oracledi/agent/drivers, to use the local agent in the studio you will need to place the file in %APPDATA%\odi\oracledi\userlib on windows (windows 2008 it is %APPDATA%\Roaming\odi\oracledi\userlib) or USER_HOME/.odi/oracledi/userlib for unix. The interface to perform the renames is created. The Datastore associated with the flat file is dragged on to the source and the “REN_MEMBERS” Datastore created earlier is dragged on to the target, there is only one column to map between target and source. The memory engine was used as the staging area as the transformation is simple and the number of records to process is small. The KM “IKM RENAME ESSBASE MEMBERS” is selected and the options populated. 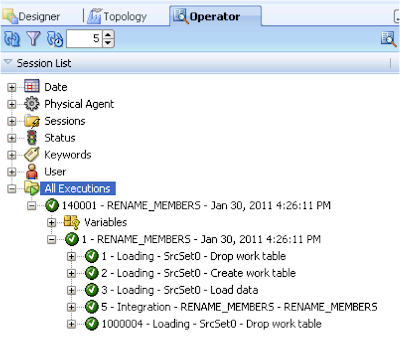 After executing the interface the Operator can be opened to view if all the steps were successful, as you can see the process followed was a temporary table was created, the records from the flat file were loaded into the temporary table, the RENAME_MEMBERS step was executed and then the temporary table dropped. Opening the essbase ASOSAMP.Sample outline you can see the members have been renamed. 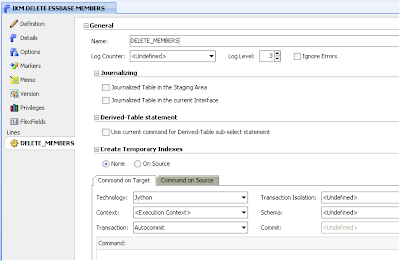 In the log that was specified by the KM option “LOG_FILE_NAME” the renamed members are logged and the member that was not found in the outline. The interface will fail, as the member “LCD HDTV” exists in the outline and it will not validate. If you didn’t want the interface to fail due to duplicate members then the Java code could be updated to check whether the rename member name already exists in the outline, one way could be to use the findMembers(java.lang.String mbrNames) method and pass the original member and member to be renamed into it, if the rename member name already exists then the member rename would not be executed and the information written to the log. 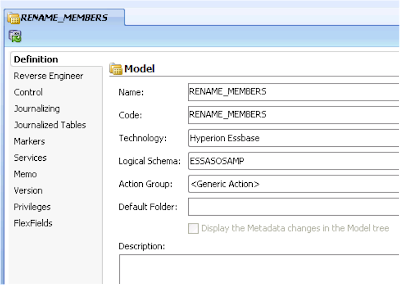 To rename members from a different essbase database the Model could be easily updated to point to a different logical schema or the model copied, renamed and then pointed to a different logical schema, once again this makes it a useful and re-usable solution. 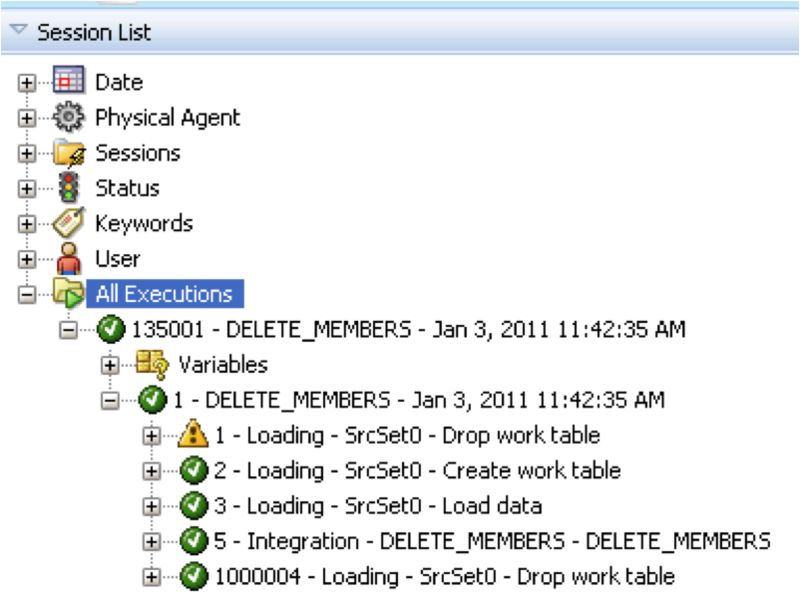 Today I am going to look at another method of deleting essbase members using ODI; in the previous blogs the methods used standard interfaces and required no customisation, they required an essbase load rule using the “Remove Unspecified” option. The method I am going to through shortly does not require a load rule and uses a combination of a customised knowledge module, jython and the essbase Java API. 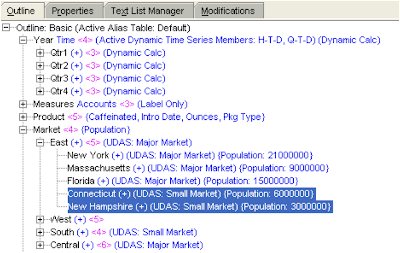 I originally only wanted to use Java and not Jython but I hit upon an issue with the way ODI translates some of the API calls where quotes around column and table names are generated, thanks goes out to Dev of ODIExperts for trying to assist me with this issue, if a solution is found I will probably provide an update. First I would like to stress I am not a Java programmer and you may find yourself questioning the code I write, though feel free to contact me if you have a different take on it. I don’t get as much opportunity as I would like to get involved using Java and the APIs available in the EPM world so I acknowledge I am a bit rusty. In my example I will be using ODI 11g but it will be exactly the same process if using 10g. 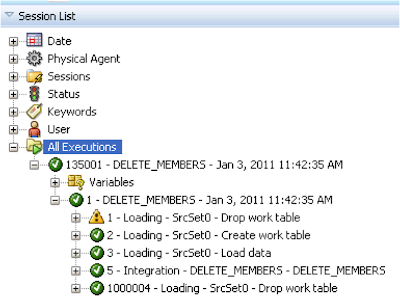 The overall aim is to create a solution that will take a source containing member names and will process the members and delete them from an essbase database, the solution should log any deletions and members not found, it should also have the option to define how to restructure the database. 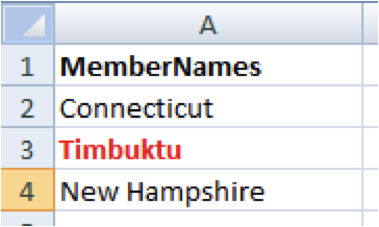 The members that are to be deleted are from everybody’s favourite BSO database Sample.Basic, the members are “Connecticut” and “New Hampshire”, I randomly selected two members so is no logic to why these are being deleted. The database is BSO but the solution should work just as well with ASO. A nonexistent member has been included in the source, the process should log that this member is not found in the outline. The source is a flat file but just as easily can be an rdbms technology. 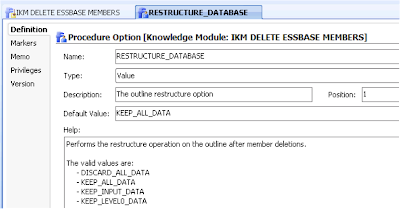 Basically the idea is to have an interface with the members to delete as the source and a datastore that is associated with an essbase database as the target; the interface will use a custom IKM that will delete the members from the essbase database. In ODI a new Datastore was created and reversed for the source file. The model is associated with a Logical schema that physically points to the Sample.Basic database. A new Datastore was added to the model. One column was manually added to the Datastore, the column is going to be used to map the source member names to. 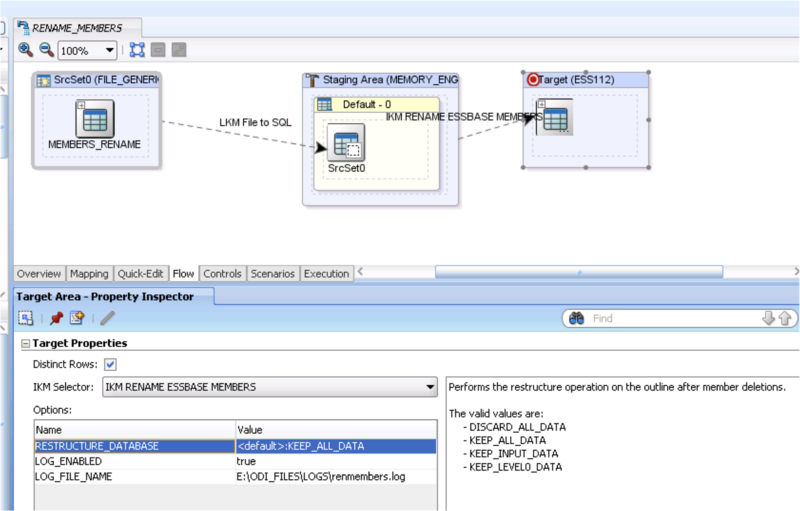 The Datastore is now complete and can be dragged on to the target of any interface; the Datastore will only be used to retrieve the physical details about the essbase database to delete the members from, if a different database is required the model can be copied and the logical schema updated to point to a different physical database. 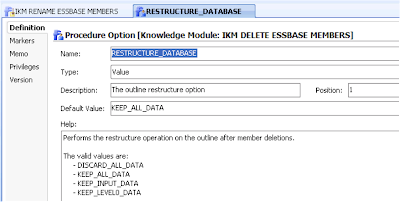 The source and target Datastores are now ready to be used but before an interface can be created the custom IKM has to be developed to do the main work of deleting the members. 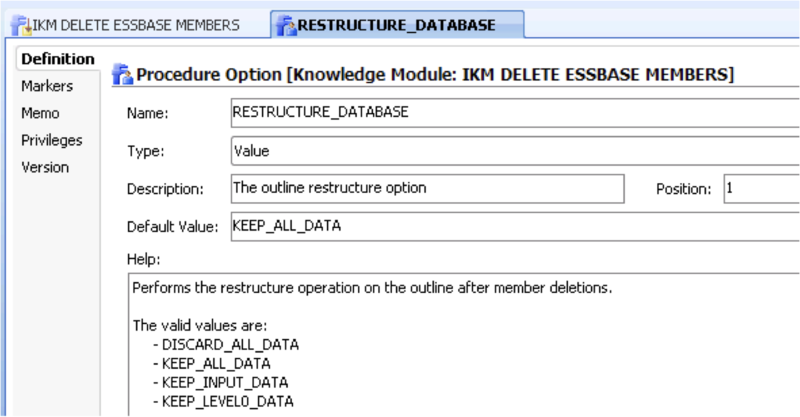 The IKM will use the same principal of the current essbase knowledge modules, it will use jython to store all the physical information about the essbase database in variables, it will store the values held in the KM options, it will execute a SQL query to return all the source records and store them in a ResultSet, this information will then be passed into a Java class for processing. If you have ever looked at the essbase KMs you will recognise some of the jython code I am going to use, no point in re-inventing the wheel. 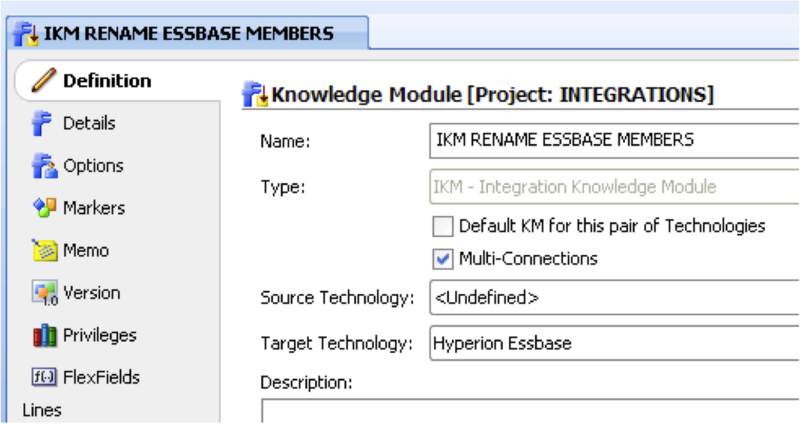 A new IKM was created with Muti-Connections enabled and Target Technology set to “Hyperion Essbase”, this is so the IKM will be available for essbase related targets in interfaces. A new command “DELETE_MEMBERS” was added to the KM, change the technology to Jython. I will break down the jython code used in the command and briefly go over what it does. First the Java classes that are going to be used in the jython script are imported; this includes the Java class that will be called to delete the members. The variables are all stored in a HashMap, the HashMap will be passed into the Java class. 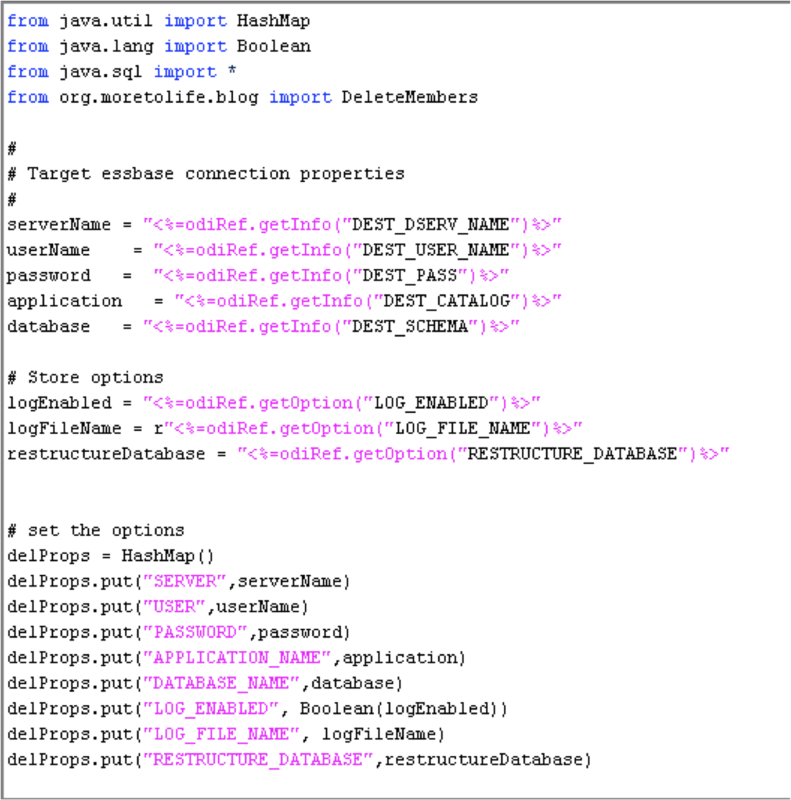 The SQL select statement is generated and stored by using a combination of ODI API methods, this code is exactly the same as used in the current essbase KMs, the output generated from the statement is the reason I had to use both jython and Java, when I tried using it in Java there were issues in handling quotes. You can always check out the description tab in the Operator after running an essbase related interface to see what SQL statement has been generated. 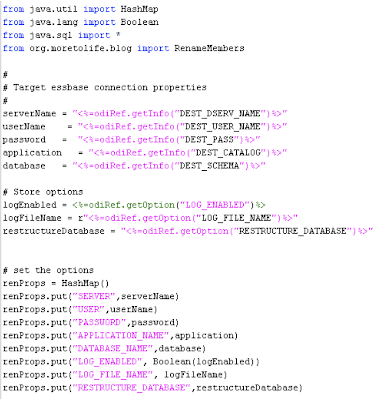 sql= """select   C2_NEWMEMBER    "ParentName",C1_MEMBERNAME    "MemberName" from "C$_0Measures"  where  (1=1)     """
Once the statement has been stored the source JDBC connection used in the interface is stored. 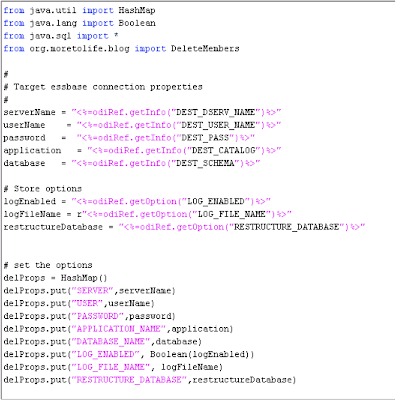 The requirement for the Java class is to extract the variables stored in the HashMap and then use this information to connect to essbase using the API, once connected open the database outline, cycle through the members held in the ResultSet and search for them in the outline, if the member is found then delete it, if the enable log option is set then log the deletions and members not found. The database should then restructured depending on the value stored in the RESTRUCTURE_DATABASE variable. I am not going to go through the Java code as I have briefly gone over what the class will do and I have put some comments within the script, if you are unclear about any of it then feel free to contact me but it is pretty simple stuff as I didn’t want to over complicate this example. The class was compiled and a jar file created, if you are using ODI 10g then the jar file needs placing in the /oracledi/drivers directory, all ODI components including agents will need restarting to pick up the new file, if on 11g and using a standalone agent then place the file in /oracledi/agent/drivers, to use the local agent in the studio you will need to place the file usually in %APPDATA%\odi\oracledi\userlib on windows (windows 2008 it is %APPDATA%\Roaming\odi\oracledi\userlib) or USER_HOME/.odi/oracledi/userlib for unix. The interface to perform the deletions is now created. The Datastore associated with the flat file is dragged on to the source and the “DEL_MEMBERS” Datastore created earlier is dragged on to the target, there is only one column to map between target and source. The memory engine was used as the staging area. 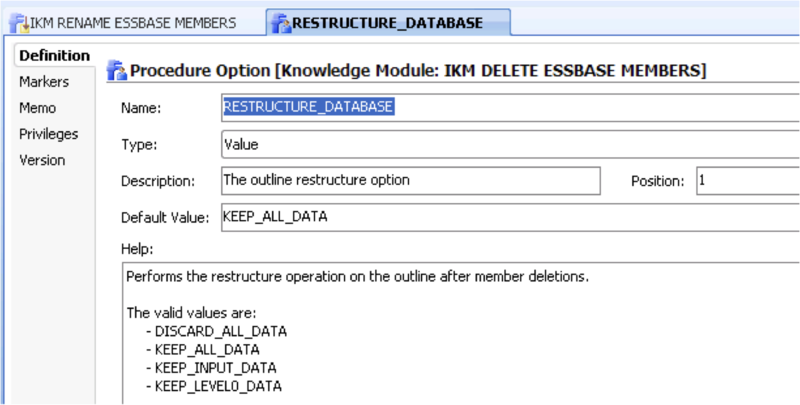 The KM “IKM DELETE ESSBASE MEMBERS” is selected and the options populated. 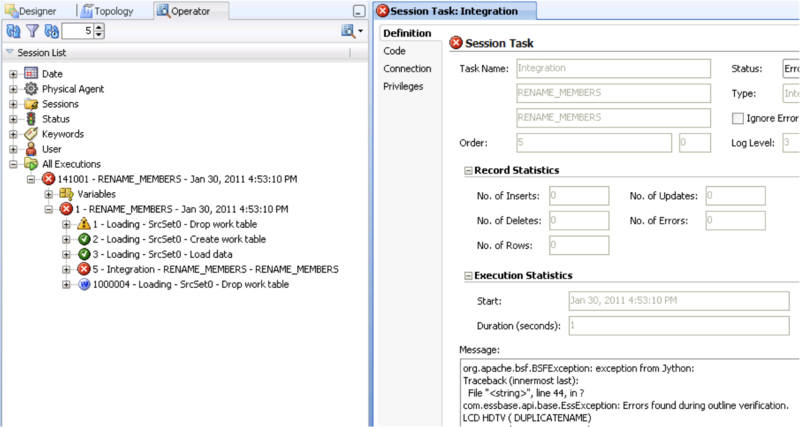 After executing the interface the Operator can be opened to view if all the steps were successful, as you can see the process followed was a temporary table was created, the records from the flat file were loaded into the temporary table, the DELETE_MEMBERS step was executed and then the temporary table dropped. In the code (description in 10g) tab for the DELETE_MEMBERS step the code that has been generated can be viewed. 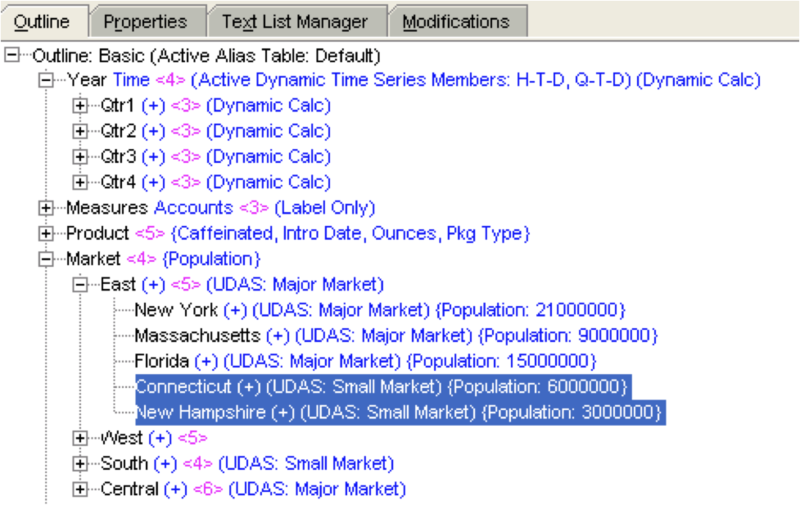 Opening the essbase Sample.Basic outline you can see the members “Connecticut” and “New Hampshire” have been deleted. 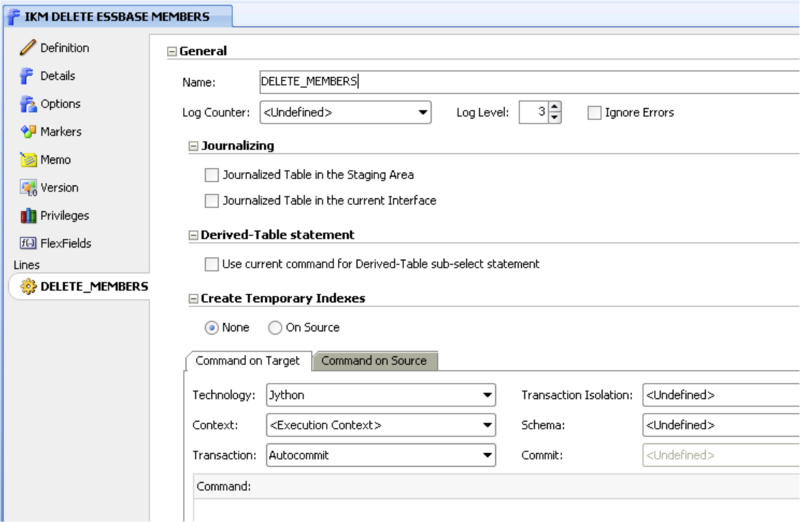 In the log that was specified by the KM option “LOG_FILE_NAME” the deleted members are logged and the member that was not found in the outline. If there is any exceptions in the execution of the interface such as not being able to communicate with essbase these will be logged directly in the operator and the interface should fail. 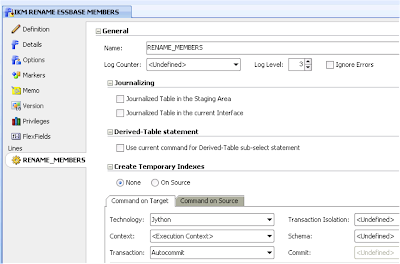 To delete members from different essbase database the Model could be easily updated to point to a different logical schema or the model copied, renamed and then pointed to a different logical schema. If required the Java code can be enhanced to be much more sophisticated and include more functionality, overall I think once this method has been developed it is a valuable and re-usable solution for deleting essbase members.